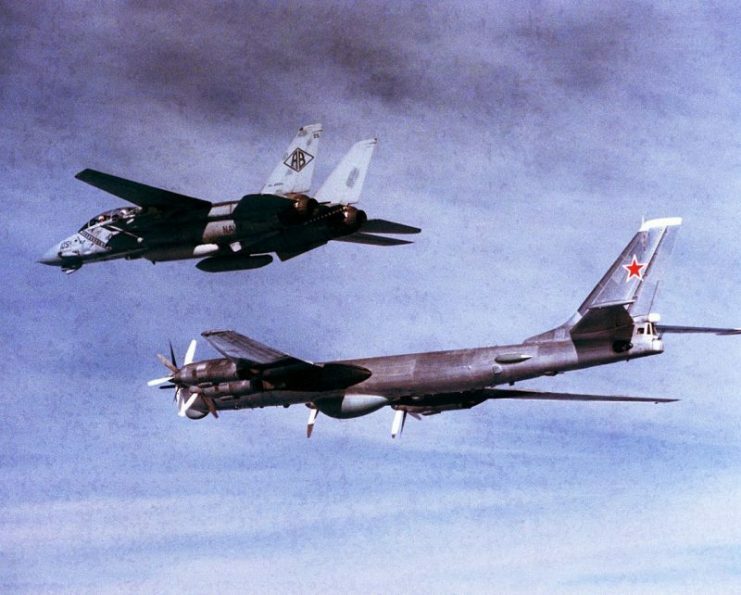 Soviet Tu-22M Backfire-B bomber aircraft is escorted by an F-14A Tomcat aircraft. The USSR’s force of long-range strategic bomber aircraft evolved out of USSR copies of the United States’ (US) B-29 strategic bomber aircraft. 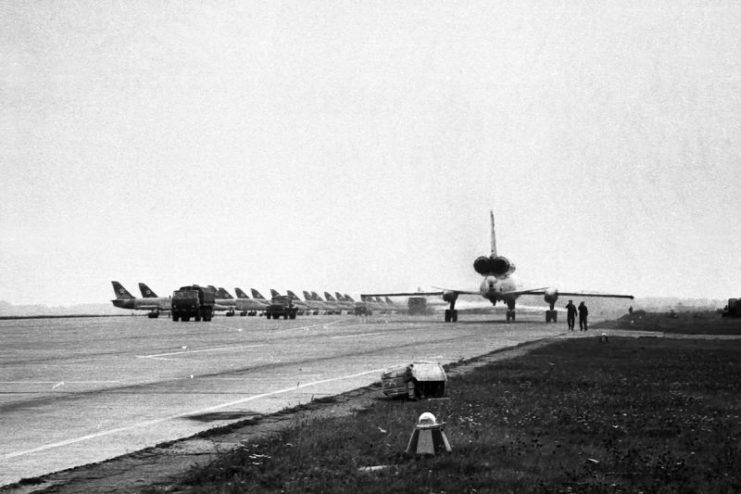 By the early 1960s, the USSR combat aircraft force had evolved into a potent air fleet of fighter jets and turboprop nuclear-armed strategic bombers. The Tupolev Design Bureau’s Bear, Badger, and Blinder Bomber aircraft formed the necessary spinal column in the USSR’s strategic bomber force. 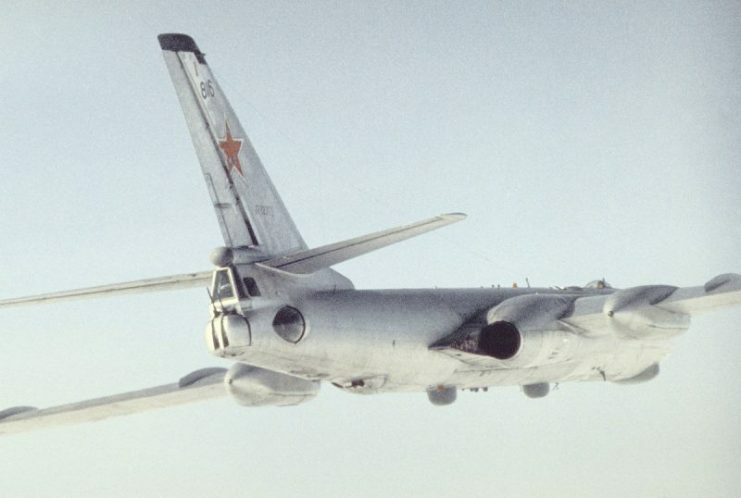 Distinct from the Strategic Air Command, the USSR’s long-range strategic aviation force never mounted significant airborne patrols and it had fewer air-to-air refueling tankers. It relied on strategic staging airbases in the Arctic region. 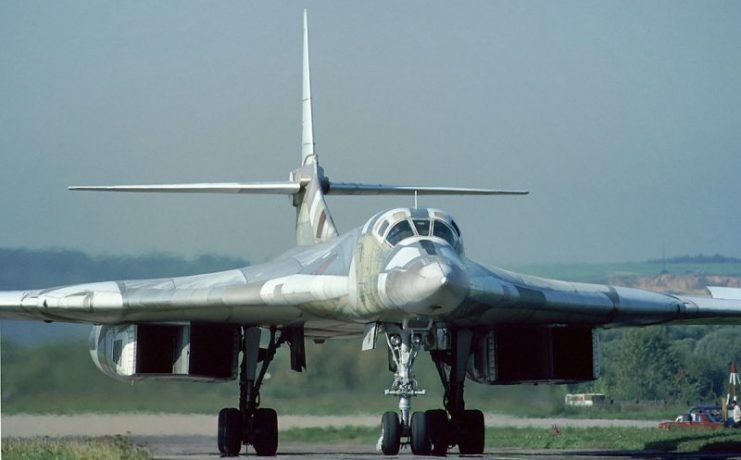 From the 1950s to the 1980s, the best bomber aircraft in the USSR were the Tu-16 Badger, the Tu-22 Blinder, the Tu-95 Bear H, Tu-22M Backfire, and the Tu-160 Blackjack. The USSR’s Tu-16 Badger combat aircraft was designed as a speedy jet bomber for rapid strike missions in theaters near to the Soviet Union. It was built to replace the aging propeller-driven Tu-4 bombers. 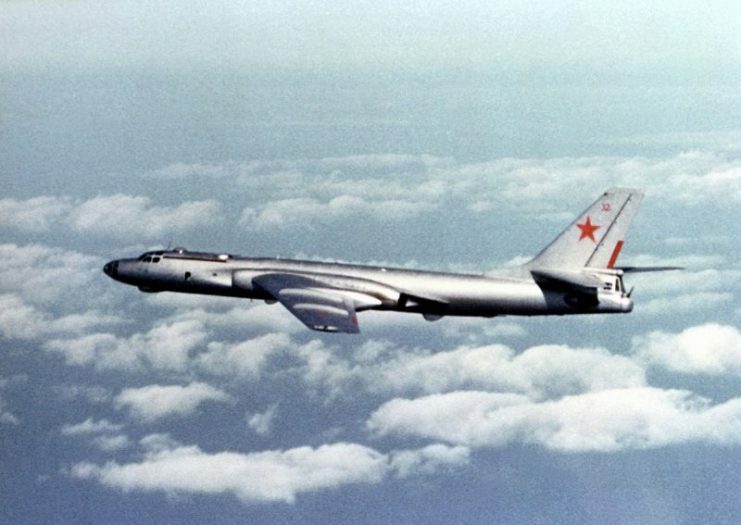 The supreme test during the USSR’s development of this bomber was increasing its speed to advance its combat survivability and durability when facing enemy fighters. Rear side view of a Tu-16 Badger reconnaissance variant (most likely Tu-16R), 1989. 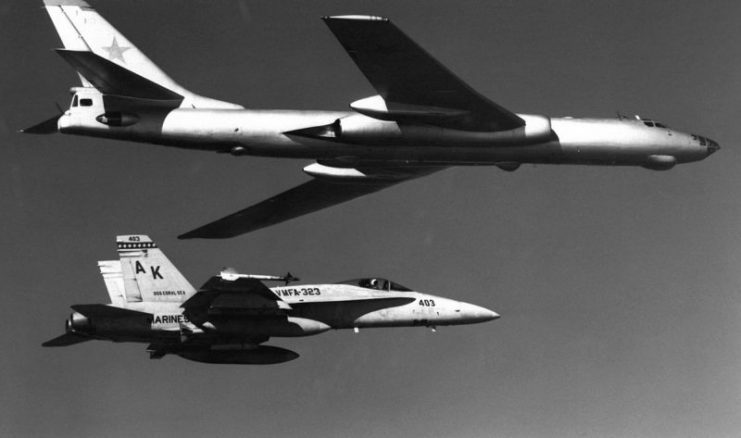 A Soviet Tupolev Tu-16 Badger aircraft being escorted by a U.S. Marine Corps McDonnell Douglas F/A-18A Hornet aircraft from Marine fighter-bomber squadron VFMA-323 Death Rattlers in 1985. A Soviet Tupolev Tu-16 (NATO reporting code “Badger”) in flight in 1984 above a Nikolaev class cruiser (NATO reporting code “Kara”). 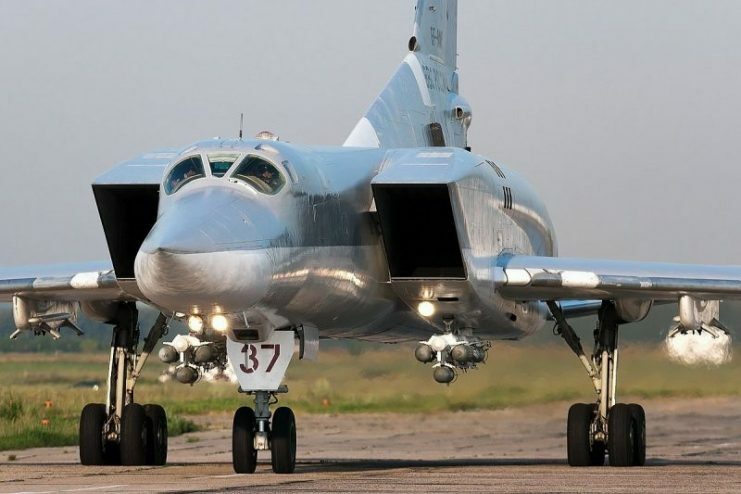 In the 1950s, the USSR designed the Tu-22 Blinder bomber aircraft to replace the Tu-16, which became obsolete due to the development of a new generation of Western interceptors and advanced missile systems. 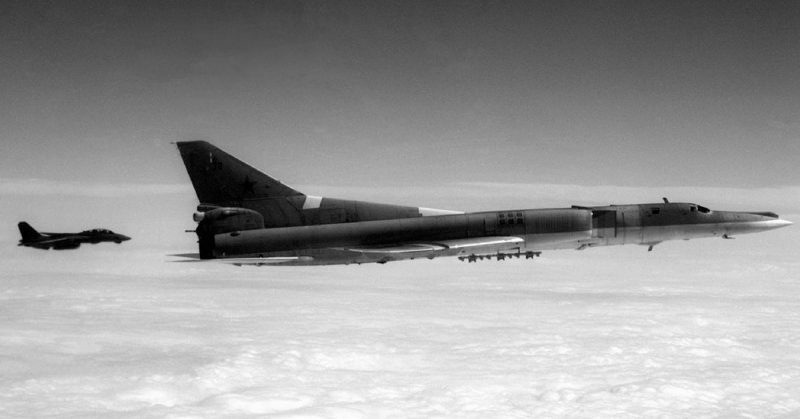 The Tu-22 Blinder was built to penetrate unfriendly airspace at high speeds and at high altitudes. The Blinder C was devoted to maritime reconnaissance missions because it is equipped with cameras and sensors located in its weapons bays. 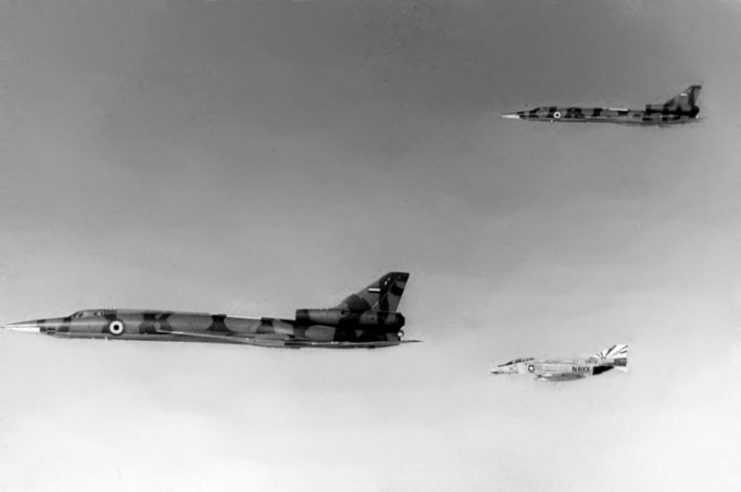 A U.S. Navy F-4N intercepts Tu-22s being delivered to Libya in 1977. 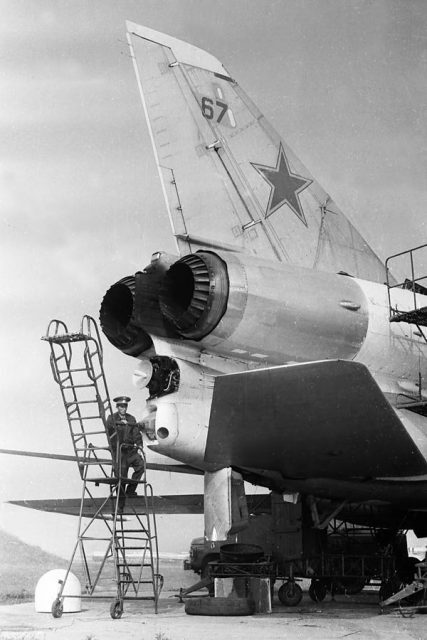 A Soviet engineer checks the 23-mm R-23 cannon in the remotely controlled tail turret. 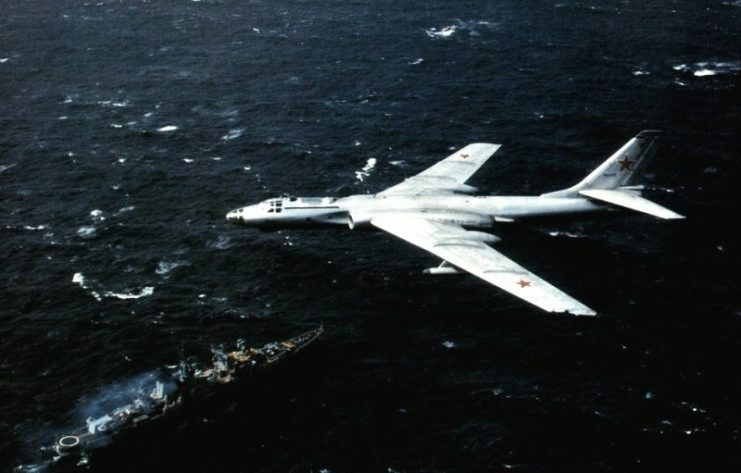 In the 1950s, the USSR designed the Tu-95 Bear H bomber aircraft. 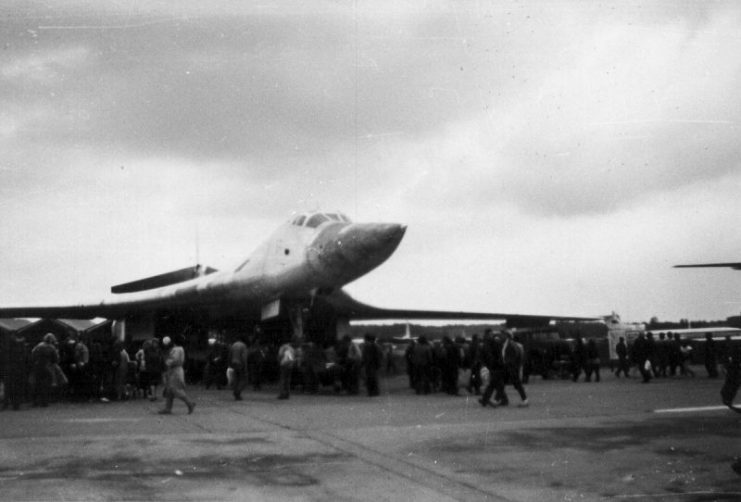 It is one of the most successful bombers created by the USSR’s Tupolev Design Bureau. 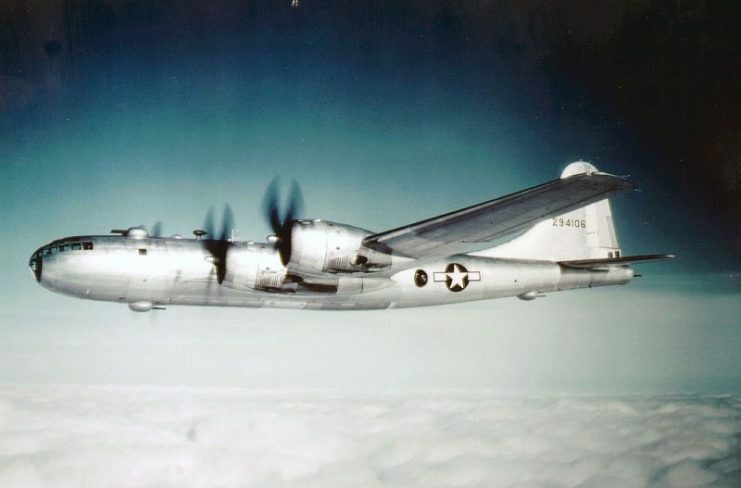 This heavy bomber has had long service in a variety of combat roles and arrangements. In the 1980s, it was the only bomber aircraft deployed by the USSR with turbo-prop engines. 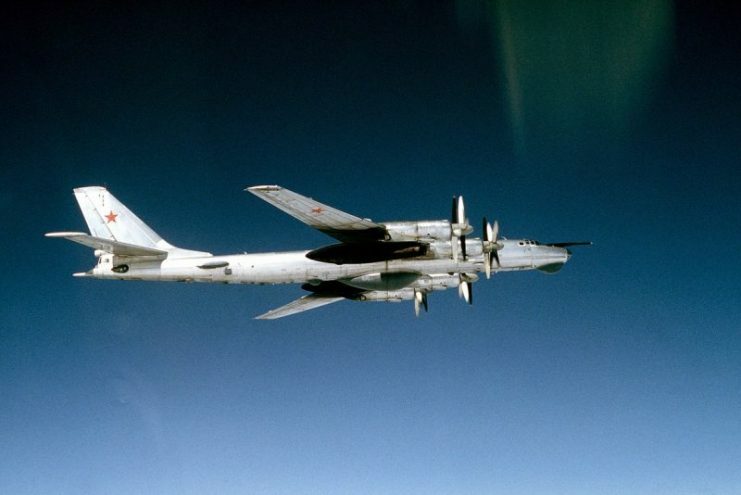 The Tu-95 bombers have long endurance at speeds a little less than some turbojet-powered heavy bombers. A U.S. Marine Corps Hawker Siddley AV-8A Harrier of Marine attack squadron VMA-231 Ace of Spades intercepting a Soviet Tupolev Tu-95 (Nato code “Bear”) in 1976/77. VMA-231 was assigned to Carrier Air Wing 19 (CVW-19) aboard the aircraft carrier USS Franklin D. Roosevelt (CV-42) for a deployment to the Mediterranean Sea from 4 October 1976 to 21 April 1977. 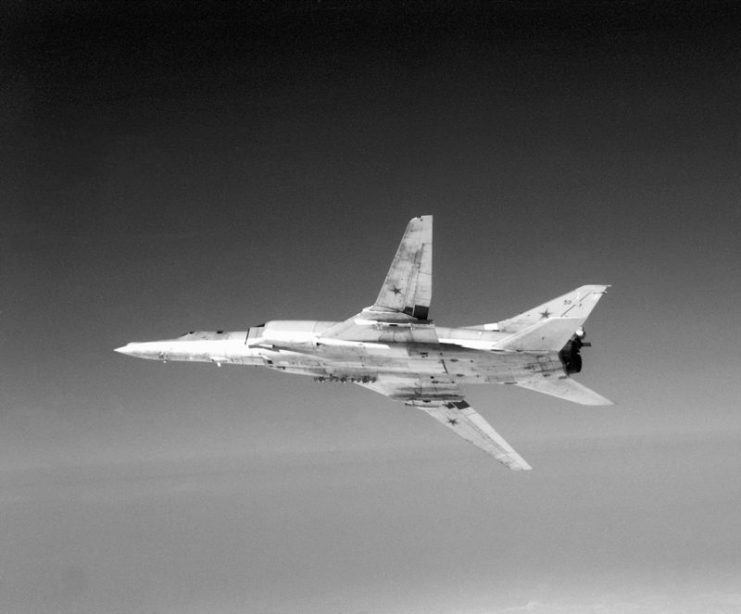 A Tu-95RTs Bear D (Door Number 17) of Soviet Naval Aviation in flight in May 1983. 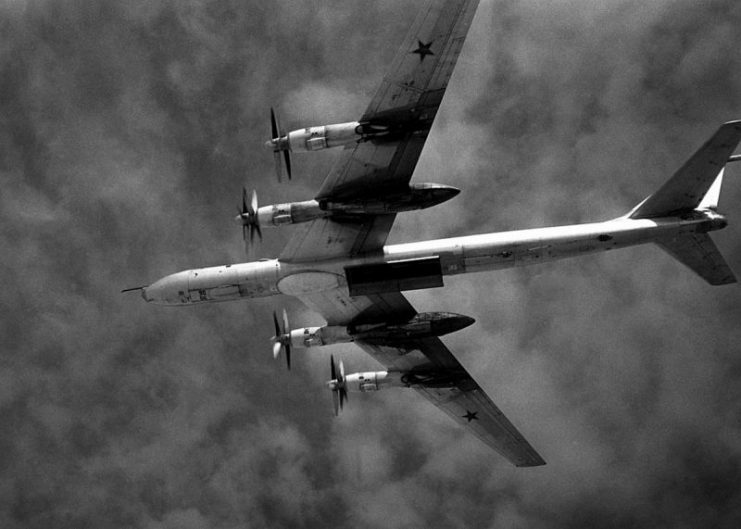 Underside of a Soviet Tu-95 “Bear F” with an open weapons bay over the Pacific in 1987. 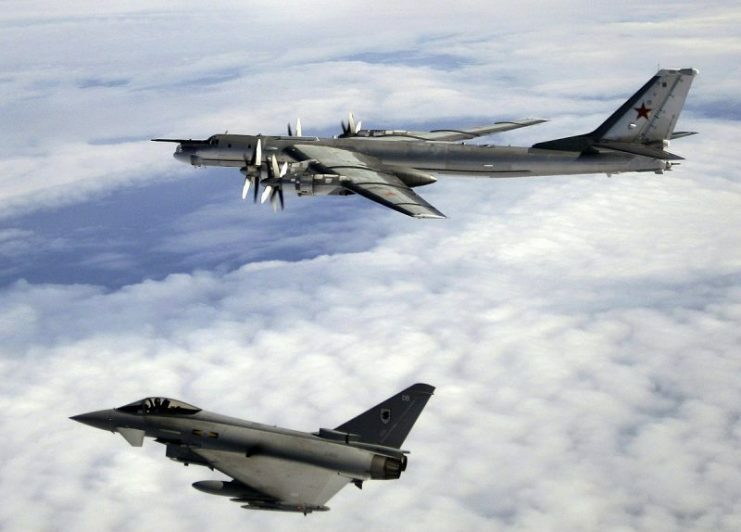 A Tu-95 escorted by an RAF Typhoon. 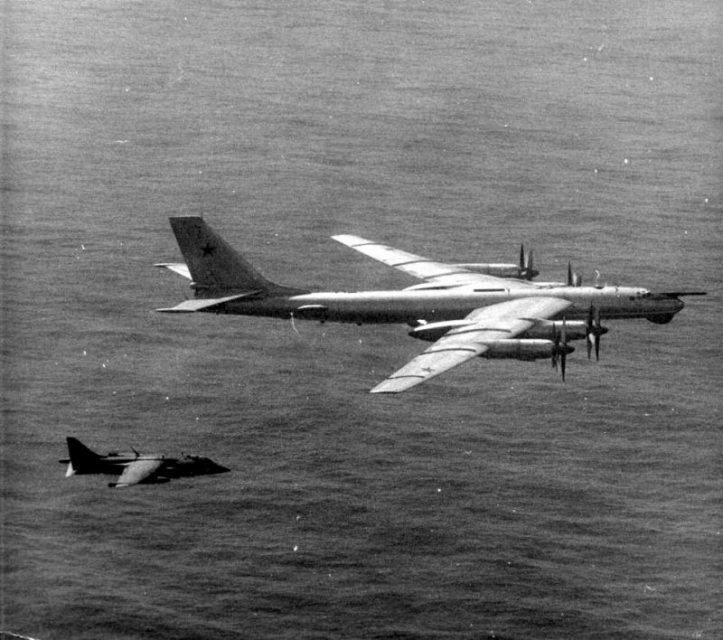 A U.S. Navy Grumman F-14A Tomcat fighter (BuNo 159452) squadron VF-102 Diamondbacks escorts a Soviet Tu-95RTs Bear-D surveillance aircraft over the North Atlantic, on 1 September 1985. VF-102 was assigned to Carrier Air Wing 1 (CVW-1) aboard the aircraft USS America (CV-66) for a deployment to the Atlantic Ocean from 24 August to 9 October 1985. 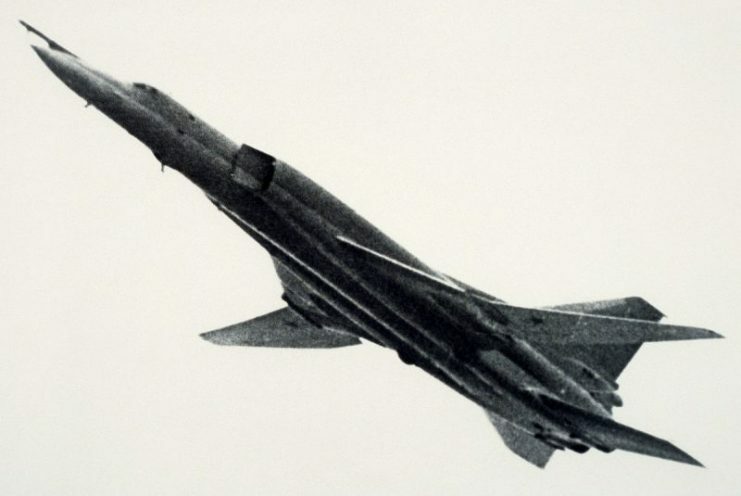 In the 1960s, the USSR designed the Tu-22M Backfire bomber aircraft. It is a long-range aircraft capable of performing nuclear strike missions, conventional attack operations, anti-ship attacks, and reconnaissance missions. It has low-level penetration capabilities that make it a much more survivable weapon system than its bomber aircraft forerunners. It can carry bombs and air-to-surface cruise missiles. It is a multi-purpose bomber aircraft that was designed for theater attack in Eastern and Western Europe. However, it is capable of intercontinental missions against the US. 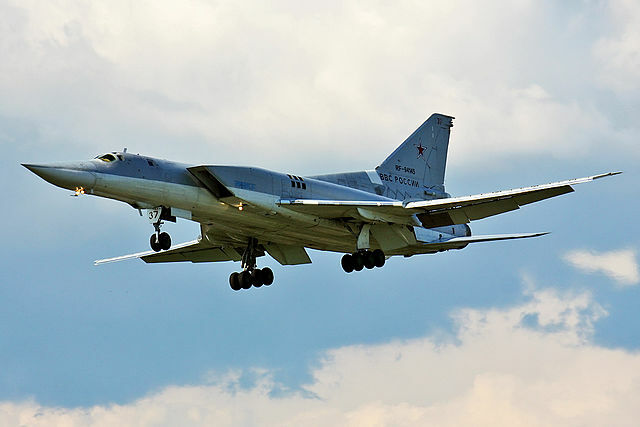 The Tu-22M Backfire can be equipped with refueling probes to permit air-to-air refueling operations, which would further increase its combat range, endurance, and overall capability. 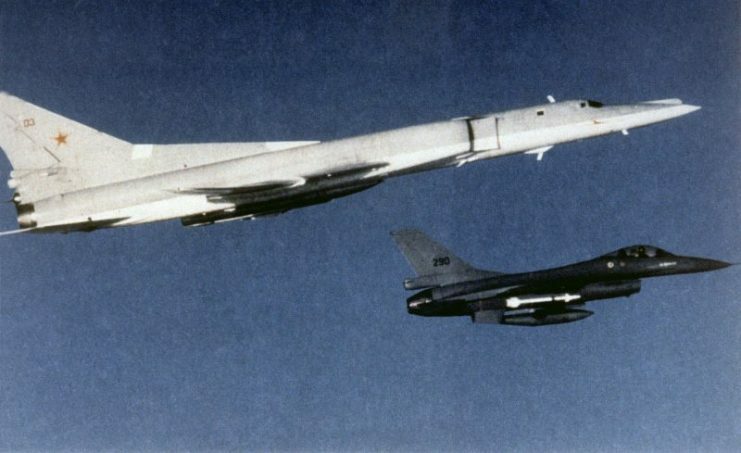 A Royal Norwegian Air Force General Dynamics F-16A Fighting Falcon aircraft escorting a Soviet Tupolev Tu-22M bomber. 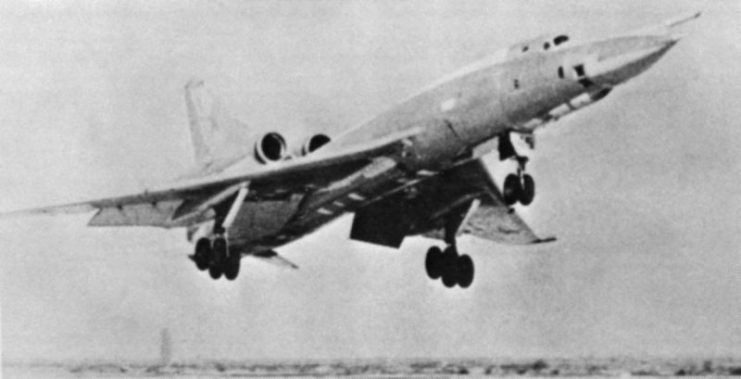 A left side view of a Soviet Tu-22M Backfire aircraft climbing after takeoff. 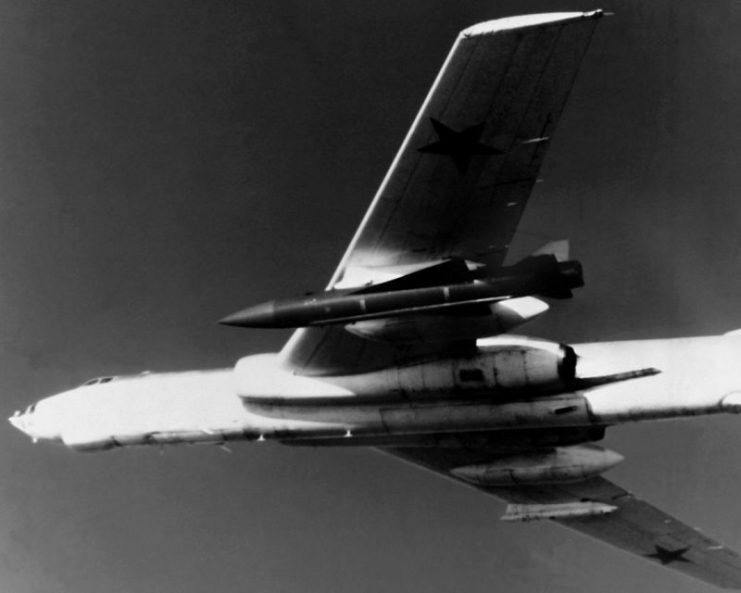 A left underside view of a Soviet Tu-22M Backfire-B bomber aircraft in flight. 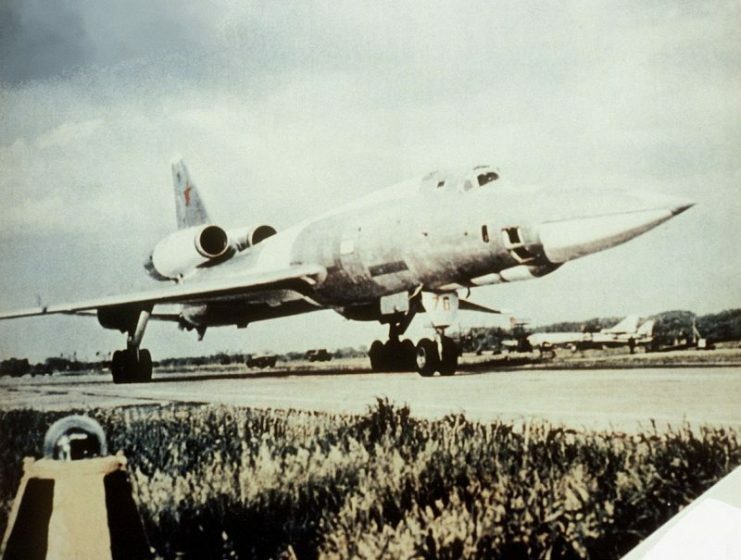 In the 1980s, the USSR built the Tu-160 strategic bomber aircraft. 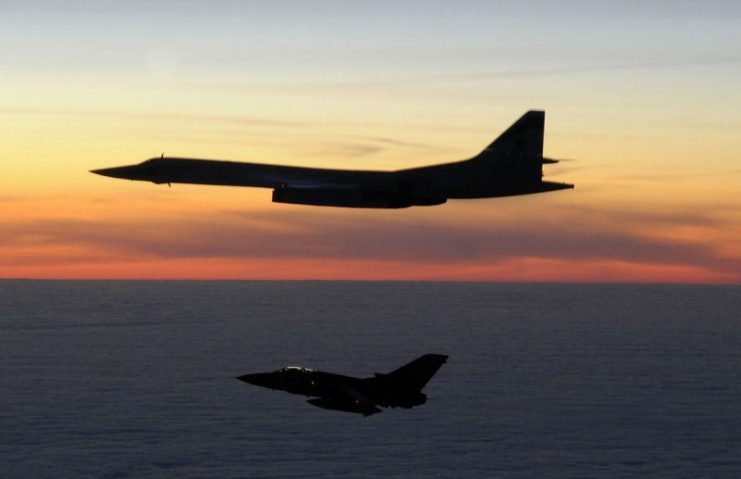 It is a multi-mission strategic bomber aircraft designed for operations ranging from subsonic speeds and low altitudes speeds and over Mach one speeds at high altitudes. The two weapons bays can provide accommodation for different mission-specific weapons, including strategic cruise missiles, short-range guided missiles, nuclear bombs, and conventional bombs. Its basic armament of short-range guided missiles and strategic cruise missiles enables it to deliver nuclear strikes to targets with pre-assigned coordinates. 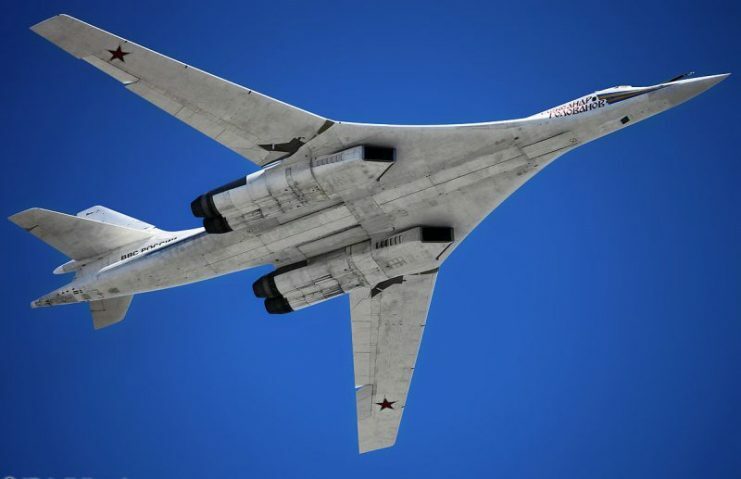 Today, the Russian Air Force plans to equip its refurbished Tu-160 Blackjack bombers with plasma stealth technology and computerized high-precision conventional weapons that could be used against tactical and mobile targets in Western Europe and elsewhere. 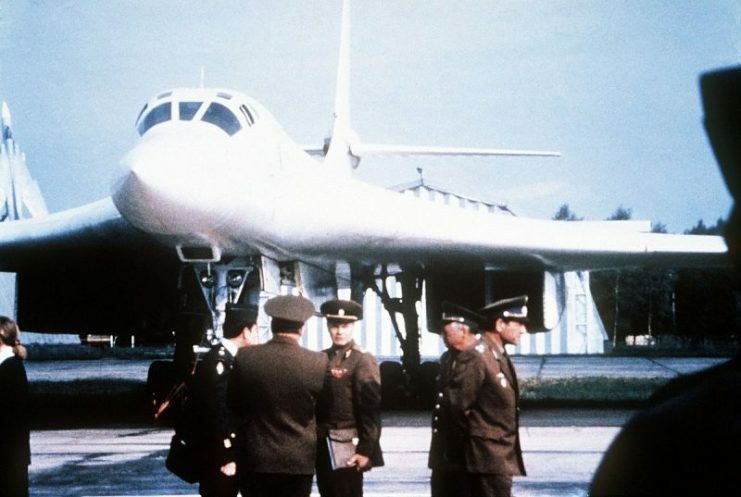 A Tupolev Tu-160 with Soviet officers in front, September 1989. Tupolev Tu-160 “Blackjack” at the MAKS Airshow 1993.